On the morning of September 11th, 2001, with the skies so clear that the Twin Towers across the river appeared to be within reach, the very essence of what our country stands for – freedom, tolerance and the pursuit of happiness – was attacked. This memorial is dedicated to New Jersey’s 749 innocent loved ones who were violently and senselessly murdered that day at the World Trade Center, the Pentagon and in Shanksville, PA. Let this memorial reflect the legacies of those whose lives were lost, that their unfulfilled dreams and hopes may result in a better future for society. Their unique qualities and characteristics enriched our lives immeasurably and through this memorial, their stories live on. Though the magnitude of the September 11th tragedy continues to affect the world, no lives have been more irrevocably changed than those of the family and friends of the innocent loved ones who were murdered that day. New Jersey lost 749 magnificent people. 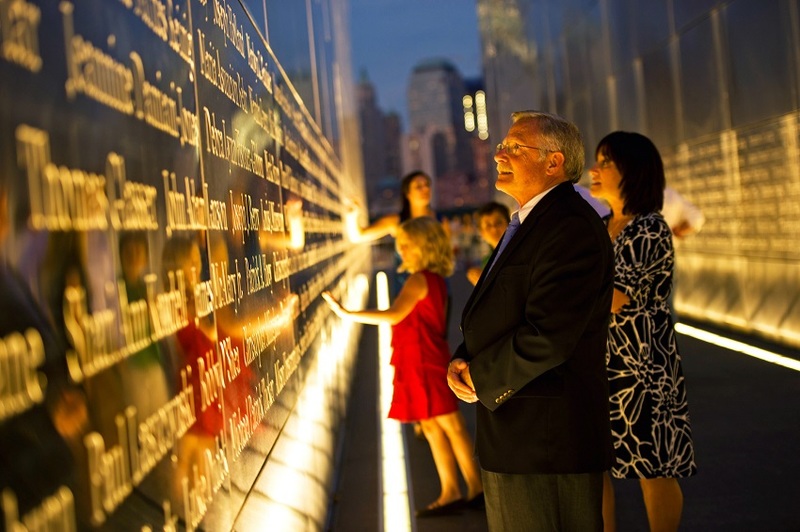 “Empty Sky” remembers those lost while simply and powerfully connecting New Jersey to Ground Zero. As people gathered at Liberty State Park on the Hudson River to first witness the event, organize rescue efforts and then remember and mourn, they found strength in their community. 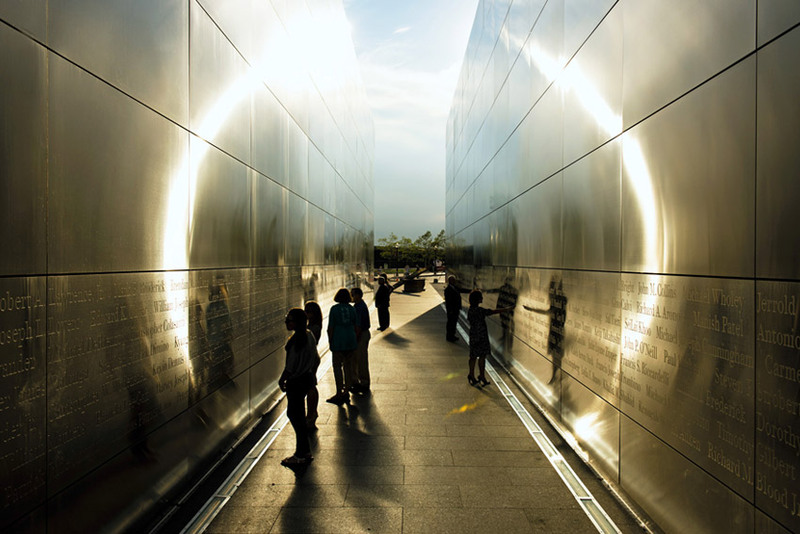 “Empty Sky” honors both the memory of those lost and the special place that they called home – New Jersey. Twin walls transect a gently sloped mound anchored by a granite path that is directed toward Ground Zero. The length of each wall is exactly equal to one side of the former World Trade Center Towers as the height of the wall reflects proportion of the former buildings if they were lying on their side. The seven hundred and forty nine (749) victims’ names from the State of New Jersey face one another on the interior elevations of the twin brushed stainless steel walls within easy reach. The walls channel visitors to the location in the Manhattan skyline where the former World Trade Center towers once stood. The low, grassy berm surrounding the walls softly rises to ten feet and then gradually returns to the level of the promenade creating an amphitheatre-like incline that faces Lower Manhattan. Clusters of weeping cherry trees atop the berm unify the landscape and reinforce the magnificent panoramic views of Lower Manhattan and the harbor.